Cool teen role models teaching STEM skills. Meet the Tech Warriors. Giordan Dixon. Photo by Rob Larson. 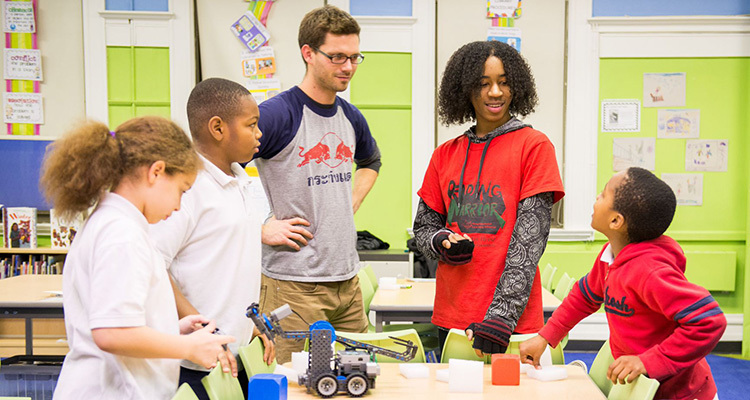 At Woolslair Elementary in Pittsburgh’s Bloomfield neighborhood, building robots is a popular after school activity. On this particular day, students gather around a long, rectangular whiteboard spread across the floor. Some tinker with last minute adjustments to their 4-wheeled bots. Others practice driving, using the remote control to steer and spin the bots around. All this is in preparation for the upcoming VEX Robotics Competition later in the week at the Sarah Heinz House. The tourney will bring students and bots together from around the region to compete in a test of robotic prowess. Teams of two work together in one minute lightning rounds to move plastic colored blocks from one end of the playing field to the other. Points are awarded for placement and stacking with a robotic claw, which is way harder than it looks. 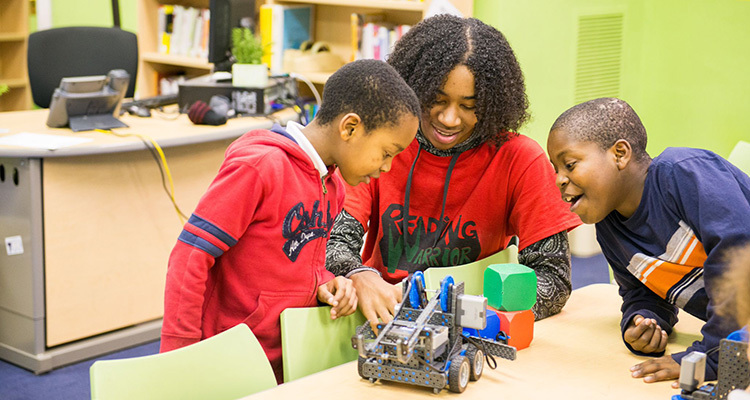 Welcome to Tech Warriors, a new afterschool program piloted this fall by the Neighborhood Learning Alliance, a nonprofit that offers educational opportunities to students and families in underserved neighborhoods in Pittsburgh. The program is a spinoff of another successful NLA program called Reading Warriors, which matches high school teens with elementary students to work on reading skills. The only difference is the subject matter. Tech Warriors help younger students with scientific literacy, otherwise known as STEM skills—science, technology, engineering and math. Tech Warriors meet with students after school, usually twice a week. The teens and teachers assist students, grades three through five, in learning coding, visual logic and the creation of animation and games. 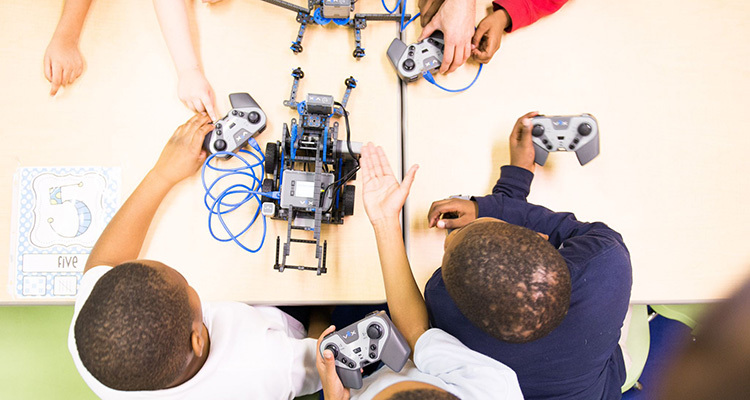 The second part of the class involves building robots using kits developed by CMU’s National Robotics Engineering Center. Karen Jueng, Woolslair site coordinator, admits she initially had her doubts. Students who struggle with math concepts are not always able to engage successfully in a program like this, she says. Those very students, however, proved her wrong. Giordan Dixon mentoring elementary students. Photo by Rob Larson. 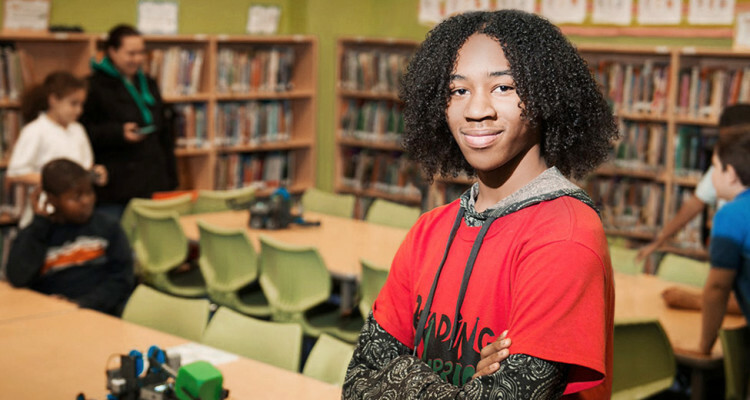 One of those role models is Giordan Dixon of Highland Park, a 14-year-old junior at Pittsburgh Online Academy. An exceedingly bright student with warm eyes and a gentle smile—he shyly admits to testing out of two grades in school—Dixon enjoys working with younger students. He found his way to the program through Assemble, the art and tech incubator in Garfield that is helping to train Tech Warrior teens. The VEX robotics competition is a serious undertaking for many of the teams who will attend–something they’ve been working on for months. Woolslair students will be winners just by being there, says Cole Hoyer Winfield, program coordinator for the NLA. The undertaking is multifaceted, involving several strategic partners who are working with the NLA including Assemble Pittsburgh, Magee Women’s Hospital, Google Pittsburgh, the Bloomfield-Garfield Corporation and Carnegie Mellon University’s National Robotics Engineering Center (NREC). “The goal is to try and change the orientation of these students to the world so they can move forward and see themselves in a different way in terms of technology and science and producing content,” says Stephen MacIssac, executive director of NLA. Beginning this January, Tech Warriors will expand to include five Pittsburgh public high schools that will send up to 40 teens to mentor students in after school elementary programs at Lincoln, Weil, Arsenal and Woolslair. Assemble in Garfield is training the teens who will receive a stipend for their time. This story is underwritten by the Grable Foundation as part of the Remake Learning Initiative, in partnership with WQED, WESA and Pittsburgh Magazine. 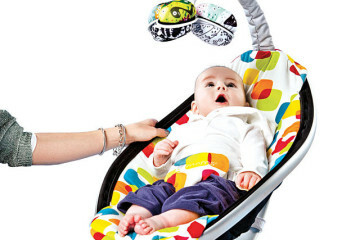 See all the Remake Learning stories in NEXTpittsburgh.